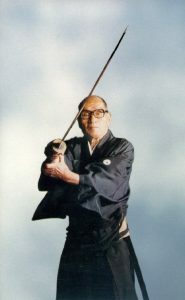 The curriculum of Tatsumi ryu consists mainly of iai/batto (sword drawing), kenjutsu (swordsmanship), sojutsu (spearmanship), and yawara (close-quarter combat). The kenjutsu includes some use of the bo (staff), hanbo (short staff), and naginata (glaive). The emphasis is on learning how to win against these weapons with a sword. There are also minor weapons such as shuriken, and a large body of teachings on various subjects such as ethics, scouting, strategy, and tactics. Tatsumi Ryu was founded by Tatsumi Sankyo, who was born in what is now Ehime Prefecture in Shikoku. He is said to have been active as a bushi (warrior) during the Eisho period (1504-1520). Tatsumi Ryu tradition has it that as a young man Sankyo secluded himself in prayer to the deity Tsumayama Dai Myojin, from whom he gained enlightenment in the sword arts. Two techniques, Muko and Marui, form the foundation of the tojutsu (sword art including both iai/batto and kenjutsu). These are the integrating principles of this sogo bujutsu. Tatsumi Ryu’s distinctive techniques of drawing and cutting with the sword appear to be unique to this tradition. During the Edo period, the ryu was widely practiced among the bushi of the Hotta domain centered on present day Sakura City in Chiba Prefecture and there was also a branch in the Okudaira domain in Kyushu. Currently only the Sakura Line survives.The well known Meiji period educator, Fukuzawa Yukichi, founder of Keio University, is thought to have been one of the last exponents of the Tatsumi Shin ryu of the Okudaira domain. The only person who can issue ranking in Tatsumi-ryû is the present Headmaster, Kato Hiroshi, 22nd sôke of Tatsumi-ryû. Rankings in Tatsumi-ryû issued by any other teachers or organisations are invalid and will not be recognised by the Headmaster. All ranking must come directly from the Headmaster.